BETTER PRODUCTION Shops Using Technology 104 MMS January 2017 mmsonline.com using one p e r son," M r. Chipma n s ays. " T he reduced labor on maintenance, which is something that cannot be billed, is now redistributed to work hours on a project that is billable." Operations Manager Shawn Ramsay says that, in addition to treducing the risk of injuries a nd e na bling quic k a nd s afe cl e a r ing of the steel shot from the machine pit for maintenance, the vacuum also has proved to be helpful in the daily maintenance a n d c l e a n l i n e s s o f the areas around the machine. In a n e nv iro n m e nt where the nature of a blasting machine is to, in effect, destroy itself over time, reducing the amount of wear and tear can increase the longev- it y of that equipment and reduce the number o f b r e a k d o w n s a n d unscheduled downtime. Because the vacuum makes light work of the heavy blast media, the f a c i l i t y n o w c l e a n s around the blast cabinet a n d a u g e r s y s te m a couple times a week, re ducing a brasion to machine parts. Before get ting the vacuum, the machine u s e d to b r e a k d o w n about once each month, a n d a l l b l a s t m e d i a w o u l d n e e d t o b e removed for some type of unscheduled main- tenance or repair. Af ter implementing the vacuum, Mr. Chip- man says the company has only had to clean the entire pit twice in one year for unsched- uled maintenance. This cut the labor required to empty the blast machine by more than 50 percent. The task of emptying the pit, which used to take eight hours utilizing two workers, now takes one worker three hours. "Now, we can shut it down in the morning, vacuum it out and have it repaired the same day Vac-U-Max, call 800-822-8629 or visit vac-u-max.com. Bye Bye, Burrs www.ezburr.com 800.783.2877 Plymouth, MI Easy. Fast. Built to Last. 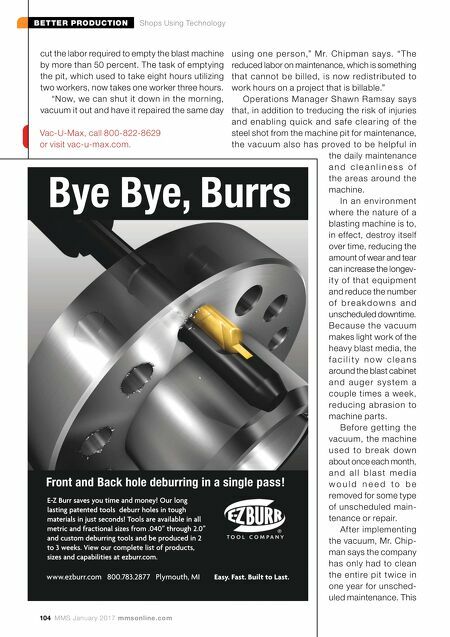 E-Z Burr saves you time and money! Our long lasting patented tools deburr holes in tough materials in just seconds! 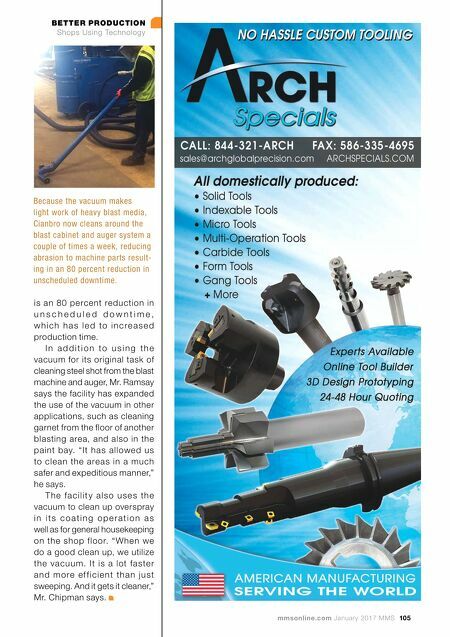 Tools are available in all metric and fractional sizes from .040" through 2.0" and custom deburring tools and be produced in 2 to 3 weeks. View our complete list of products, sizes and capabilities at ezburr.com. Front and Back hole deburring in a single pass!